You need the best RV dehumidifier for enjoying comfortable air inside your RV or trailer. Dehumidifiers are extremely useful utilities that prevent air inside of a room from getting hot. These devices help to prevent people from sweating too much, in addition to keeping parts of the room from developing mold and mildew. Not only would you like a dehumidifier for your RV so that the air around you is cool and pleasant, but you also might consider reselling the RV one day, too. Cases of mold will certainly impact its resale value, which is all the more reason to use a dehumidifier. In this review, we will examine five popular dehumidifiers for RV from companies such as Keystone, Frigidaire and Eva-Dry. Each dehumidifier has their share of strength and weaknesses, but there is only one that we will recommend to you at the end of our search. Without further ado, here are some of the dehumidifiers for RVs that you will find on the market today. Can be moved with wheels. Works to save you money. Requires no hose or filter. Comes with a 2 to 2.5-year warranty. Works with or without a hose. Frigidaire is a popular name in fridge manufacturers, but they also make products like dehumidifiers. This is the 70-pint model, but there are also 30 and 50-pint versions available for this dehumidifier. This dehumidifier features “ready-select” electronic controls with a digital readout. That you can priminently see from feet away. With a 24-hour on and off timer, you can set and forget your temperature settings so that you will never have to manually tinker with your dehumidifier at fixed times of day. Have it on for as long as you need to and it will also shut off on its own after a number of hours. Included with this dehumidifier is a one-year warranty. You have 365 days since your purchase to figure out if the product is working as intended, or you will need to return it to get a brand new one for free. There is a portable filter that you will need to clean every now and then. The filter will need to be cleaned so that the dehumidifier continues to spread cool air and to have water in its reservoir. This dehumidifier, in order to further save money, will run at cooler temperatures, down to 41 degrees fahrenheit. This is not an air conditioner, however, so we also recommend a portable fan to help cool any stale air inside your RV or trailer. This is a rather quiet device with the only audible aspect of it is its fan. The fan sounds nice for quiet background noise, and you won’t be able to hear the compressor at all. Trust us when we say this is a dehumidifier that your whole family could tolerate. The achilles heel of this dehumidifier is its compressor. When this part acts up, it makes the dehumidifier incapable of converting hot air into water. From there on, you would just have a very expensive fan. Plugs into an outlet directly. Eva-dry offers a cheap, small and renewable dehumidifier that can plug into a wall outlet. This is ideal for rooms, homes, and RVs and trailers. Within a ten-foot radius inside a room, this is a simple dehumidifier that can work in any type of small space indoors. How it works is that when in use, the crystals absorb humid air. When this happens, they turn from orange to green in color. When all the crystals are green, you need to “recharge” them by plugging the device into a wall outlet. The concept of this dehumidifier for RVs is rather a creative one, and the use of renewable energy makes it a foreshadowing of what might come in the dehumidifying game. We also like the fact that no filtration is required, nor are we left to deal with a big, bulky hose for hot, moist water to escape from. We wish we could deal with neither, and fortunately, this is one dehumidifier that can do just that. What is great about this dehumidifier is that it can last for up to 10 years, which is a very long time. There are not that many dehumidifiers on the market that can last this long, with all the innerworking that need to be maintained constantly. There is a five-year warranty included with the purchase of this dehumidifier, however, due to the simple nature of this product, it may not even be necessary. You can tell very early on if it is defective, which is basically all there is to indicate if something is wrong with it or not. This simple isn’t an ideal dehumidifier to be any useful for RVs. If you were to use this in arrid outdoor temperatures, we guarantee that it would lack the power to be of any use to you. We find this to be more ideal for rooms like storage facilities and art galleries where moisture can cause colors on objects to fade. Is it possible to get more coverage by buying and using more of these at once? We don’t think so. hOmeLabs offers this next dehumidifier for 70 pints per day of water collection. There are 50 and 30-pint version as well, but the 70-pint version is likely the most ideal for trailers and RVs. This is another dehumidifier designed to remove lots of moisture in your RV or trailer’ air per day. Compared to Frigidaire dehumidifier, this one is significantly more affordable. This is touted by hOmeLabs as a “moisture-sucking beast”. There is a continuous drain hose outlet, so rather than storing the odorous moisture in a reservoir, it can be transferred out of your RV altogether with no need to clean your filter. You can also opt to have the dehumidifier run portably, but it will stop running when the reservoir is 100 percent full. You get a two year warranty with every purchase. You can also extend that warranty to six months so long as you register your project on hOmeLabs’ website. This is two-and-a-half times the warranty offered by Frigidaire. The 24-hour timer feature is also present, allowing you to automatically have your dehumidifier run at fixed times of day. No need to manually turn it on or off unless you prefer to. The problem with this dehumidifier for RVs s that the fitting is made of plastic. You cannot screw your own fitting on, so if you were to break the plastic fitting off, that would not be good, and the warranty would also not help you, there. Furthermore, despite the Energy Star certification, owners have been floored over how much money this dehumidifier truly costs to run, which is much higher than anticipated. You will be spending more money per month, and this is not what many RV owners have been hoping for. Fittings are made of plastic and don’t come off. Uses more power and requires more money. Keystone’s dehumidifier for RVs is the most affordable in this review thus far. They are a well-known name in HVAC units, but they also have a reputation for their dehumidifiers, too. 3000 square feet is the coverage that this dehumidifier can provide. That might sound like a downgrade, but perhaps it is right for your RV if you feel you don’t have a very large vehicle to maintain. The filter that this dehumidifier has is easy to clean and a cinch to take out and put in. Should the filter get congested, the machine can easily alert you with a visual cue on the interface. The 24-hour timer allows you to set the setting once and they will take effect indefinitely. At certain times of day, this dehumidifier will turn on and off so that you aren’t requires to fuss with it yourself. This dehumidifier comes with a five-year limited warranty, which is a long time for coverage and protection. We encourage all consumers to take advantage of lengthy warranty periods to ensure they get products that work 100 percent. In case of a blackout or power outage, this dehumidifier will save your settings so that you won’t need to manually set them all over again. This might not be useful for RV use, but it could be should you also use this for your home. This is another dehumidifier that produces little noise during operation. People will enjoy how quiet it is and how they can still manage to have conversations as the dehumidifier goes to work. Some dehumidifiers of this model do not actually sound pleasant. If something were to go wrong, the dehumidifier could vibrate and you could hear its plastic casing shake. Unfortunately, the warranty does not cover this, and you would need to open the machine up to attempt to fix this problem, which makes the warranty void. Might rumble or shake during use. Pro Breeze offers this final dehumidifier, which is small like Eva-Dry’s, but runs on electricity rather than nonrenewable energy. This is a small, lightweight and portable dehumidifier with a 16-ounce water reservoir. It can fit in just about any space and will not serve much of a hazard where you place it in your RV. It doesn’t need a handle nor a set of wheels. This dehumidifier can only work in a room that is 15 by 15 feet. It is not big by any means, but perhaps you don’t need a device that covers more than that. We like that the dehumidifier will shut off automatically when the water tank is full. There will be a light that lights up to let you know. Once you empty this tank, the dehumidifier will run again. With the purchase of this dehumidifier, you get a warranty that lasts for one year. In that year, you can check to see if the specific model is up to standard or if you need a free replacement. This is a good, cheap dehumidifier, but it certainly isn’t without its limits. For one, it only extracts about nine ounces of sweat per day, that is only as big as ¾ of a can of soda. It won’t perform as well as more expensive dehumidifiers in the same sized room, unfortunately. You likely need to remove more warm, moist air than that for your RV. Additionally, this dehumidifier will only work in temperatures up to 86 degrees Fahrenheit. It is hot and sweaty in your RV? Are you settling in the desert or are experience hot weather in Florida? Then this dehumidifier won’t be able to help. If you used this in your home at room temperature, however, then this would be okay. Has a strict temperature limit. Dehumidifiers usually costs around 15 to 35 dollars per month to run, with that amount varying by the pints per day, as well as general usage. If you are looking to go in humid environments with your RV, you will need to have your dehumidifier run fairly often, at the chagrin of ongoing costs. With this in mind, look for dehumidifiers that are Energy Star certified, as they tend to work efficiently using less power, leading to saving money on your power and electricity for your RV or trailer. How do you plan to use your dehumidifier, and how often? Dehumidifiers need to be run very often, likely because humid and moist air can occur at any time of day. A good rule of thumb is to have the dehumidifier run for 12 hours daily. While you don’t need to abide to this rule, that is how often you will need to have your dehumidifier run if your goal is to always have fresh and clean air in your RV. Will it have a permanent home, or do you intend to place it in the basement, and then move it to the RV and back? Most dehumidifiers are mobile, meaning that they are travel-friendly and can be carried from place to place with no trouble or heavy lifting. There are some dehumidifiers that are permanent and are installed on a person’s floor or wall of their home, and they do not move. All of these dehumidifiers, however, are considered mobile and can move wither with their lightweight nature or with a set of wheels and a handle. Portable dehumidifiers can be used for more than one room, in this case, even if you normally use your in your primary home. The size of a dehumidifier is determined by its ability to remove moisture from air. This is considered its “capacity”, and this capacity is measured in pints of moisture removed in a 24-hour span. When you see for instance a “30-pint dehumidifier”, it refers to a model that removes 30 pints of water from wair each day. 30-pint dehumidifiers can remove moisture in spaces of up to 300 square feet, which is powerful in its own right. 50-pint dehumidifiers, however, can remove moisture in spaces of up to 700 square feet. As or 70-pint dehumidifiers, they can remove moisture in space of up to 1500 square feet, or 150 by 150 feet. This can be as large as a whole gymnasium. But for RVs, you likely only need 30 or 50 pints per day removed. 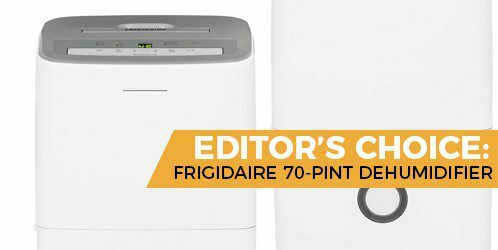 The best dehumidifier for RVs is none other than the Frigidaire 70-Pint Dehumidifier. Out of all the dehumidifiers in this review, the one from Frigidaire is the most competent. It removes moisture throughout the whole vehicle, and it can simply do so without you needing to tinker with it. Furthermore, the water reservoir is decent enough to where you won’t have to refill it ever couple of hours or so. The hOmeLabs 4000 Sq Ft Dehumidifier is considered our runner up, but it is marred by high power and consumption that it will drain you of electricity and money. Frigidaire’s model is easily energy-efficient. While we do not recommend Frigidaire’s dehumidifier for every RV, we find it to be the best dehumidifier that you will find today.